Longtails to Railay beach leave from Krabi Town pier opposite the Customs House to East and West Railay and Phra Nang beaches. The cost is about 70 Baht per person each way and the jouney takes about 40 minutes. The longtails will run when they have a minimum of 6 passengers and leave at anytime from 07:00 until 17:00. If you don't want to wait for other passengers to make up numbers, you will be able to charter the boat at a price agreed with the boatman. From Ao-Nang longtail boat leave directly off the beach to West Railay, Phra Nang and Tonsai Beaches. The journey takes about 20 minutes and the cost is about 40 Baht per person each way. The boats run from 07:00 in the morning until 18:00 at night. 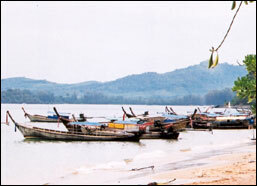 Start from the white long beach of western Ao Rai Lay by long tailed boat in front of it. 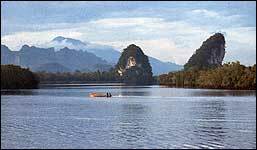 Nearby Ao Rai Lay, if you come from Ao Nang, it is Ao Ton Sai that has accommodations, climbers who want cliff as "Over Hang". A coconut trees belt connect western Rai Lay and eastern Rai Lay together. Accommodations are bungalows, 5 stars of hotel. There are internet cafe, groceries, tour companies, climbing cliff shops. Ao Rai Lay is the center point of a new climber of cliff in all over the world. It is not difficult or easy, also there is a training for climbing a cliff in 3 day, 1 day or 1/2 day. All year round but it is better in November-April because it is not rainy season.